Cemetery visits are a common part of genealogy research. In the course of your research, you will undoubtedly come across an obituary, a funeral card, or other death record which will indicate the cemetery where your relative was buried. You may also want to ask your family members if they know of cemeteries where relatives are buried. Perhaps the burial site is even nearby. If it is, you may wish to make a visit. You may discover other relatives in the process. While you may know the cemetery in which your relatives are buried, this is different from knowing where in the cemetery their graves are located. This can be especially problematic in large cemeteries, or, if there is no marker for your relative. If possible, check with the owner or sexton of the cemetery. They usually keep good records of who is buried where. Remember, there are usually many people buried in a cemetery without a marker, so sexton's records may be the only clue as to the location of a particular grave. Many older cemeteries may not have a sexton, and in some cases, the owner of the land the cemetery is on is a private citizen who doesn't have records of the burials. If you are fortunate, the owner may be a relative, and may be willing to share with you information or relics related to your mutual family. In other cases, if the owner is not a relative, you may not be able to access the cemetery. If you don't have permission from the owner of a cemetery on private land, don't visit. In general, active cemeteries have a sexton in charge of maintaining records. Inactive and abandoned cemeteries are less likely to have a sexton, and therefore, less likely to have records. Sexton records offer have a wealth of information that may not be found anywhere else. In addition to the burial location, there is often information on the living relatives. You may also find information on your relative's cause of death, occupation, residence at the time of death, military affiliation, or plot ownership details. When looking at these records, you want to gather enough information to be able to say with certainty that the "John Smith" you are related to is the correct "John Smith." In larger cemeteries, there may be more than one "John Smith." Tombstones may not be sufficient to figuring out which "John Smith" is related to you. It is often possible to write to a sexton for records before you go. If you have the address of an active cemetery, you may wish to write them in advance or your visit to get records, maps or other details. This can be of especial help if you are traveling a good distance for the visit. If this is a rural or abandoned cemetery, were long pants. You may have thick underbrush to walk through. Bring a hat, especially if you are planning to be gone for a few hours. Sunburn is less than fun. Be aware that rural cemeteries may be home to insects, snakes, or other "critters" that hide in tall grasses or hollow trees, or other natural features in cemeteries that aren't regularly maintained. Wear practical clothing. Spring can be an especially good time to visit. In spring, most people are itching to get out of the house and enjoy the weather. A visit to a cemetery is a lovely way to get out, and spend some hours outdoors. Many modern cemeteries were built as parks, after all, and are designed to have good walking paths and peaceful grounds. Most cemeteries are open from dawn to dusk. Some, however, are closed earlier, or have set hours when they are open. If you are intent on having the best photos, you may need to pick a time of day when the sun illuminates the stones as well as they can be lit. If it is early spring, and you are traveling to a higher elevation, check to make sure the snow has melted. In Colorado, snow can still be on the ground in the mountains as late as mid-May/June. In April, it's bound to be higher than most monuments. As the snow melts, it leaves muddy patches, which may be tricky to navigate, so, plan to visit when things have dried out a bit. Plan to bring, at the very least, paper (notebook) and a pen or pencil. Use a clipboard for a firm surface. When I go, I like to bring my GPS unit (to record the exact coordinates of the gravesite). This is especially useful in older cemeteries where there aren't any sections or rows marked out. I also bring a camera. If I'm recording a cemetery, I let my sister do the photographs, so she carries the camera(s). Bring bottle of water, not only for hydration, but, for helping to clean tombstones. The picture on the left is the stone before I added a bit of plain old water to it. The picture on the right is the stone afterwards. You may wish to bring a mirror. Sometimes the lighting on a stone a the time of day you are visiting, is insufficient to read it. A mirror can be like a low-tech flashlight, to help read inscriptions. If the cemetery is somewhat remote, or in a dangerous area, it's a good idea to bring a friend along. You don't want to be stuck, all alone, if you sprain your ankle on uneven terrain, or trip over stealthy foot stones. Older cemeteries are sometimes located in "urban jungles" that have hazards of their own. Be aware of your surroundings. Cemeteries, especially older ones, may have rules governing what you can an can't do. Be respectful of these rules. Some cemeteries have rules against making gravestone rubbings. This is usually for a good reason. If you'd like to leave flowers or other tokens at your relative's grave, please make sure they conform to the cemetery rules. After you have located the site of a relative's grave, spend a moment to record the information on the tombstone. In addition to birth and death dates, you may find a maiden name, family relationships (i.e. "mother" or "brother"), town of origin, and possibly a religious affiliation. All of this can lead to other discoveries and areas to continue your research. Look around. You could see many other relatives that had been, previously, unknown to you. It is common for people to be buried near other family members, not only of their original family, but also a family they've married into. It is not uncommon to find young children or infants buried in these plots. These small tragedies may have been unknown to you, and researching their death records may also provide valuable information about their parents. If you find that the grave has been freshly decorated with flowers, You may have another unknown or long-lost family member. If the cemetery has a caretaker, they may know this person. If not, you could leave a note in a weatherproof container, so that the person visits the grave can contact you. Be careful about the kind of contact information you leave, as you never know who might find the note. You brought your camera, right? Remember that part of the point of making a photo of the marker is to be able to read it later. You may not know the condition of the stone before you go. In some cases, the writing on the stone maybe very difficult to read, so taking a photo that can be read may be a challenge. Squirting the stone with water is the safest way to help illuminate the writing, and is surprisingly effective. Making a rubbing of the stone should only be done if the stone is in good condition, and solidly secure on the site. Again, remember to check the cemetery rules to see if this is okay. 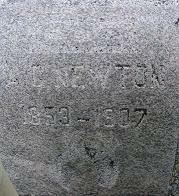 Photographs are can help a researcher or other family member the feeling of visiting the cemetery. Visiting a grave is sometimes the closest you can get to meeting a relative. Many people don't get the chance to visit their relative's gravesite, and a photograph or two can be the next best thing to being there. When visiting cemeteries, it is important to treat the headstones and markers with care. 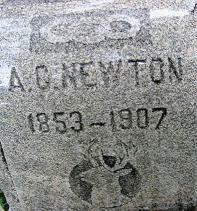 Many of these tombstones are very fragile, and even the pressure used to make a rubbing can damage the stones. One method I've seen recommended is to use shaving cream and a squeegee to temporarily "fill in" the lettering to make it easier to read. DO NOT apply shaving cream or any other chemicals to the stones. This can cause serious damage. Unless you are an expert in preservation, I recommend leaving the stones alone, and using nothing stronger than water on them during your visit.